Our team of RV fanatics have researched and tested until we found the best AC units available for RVs. To make this process as pain-free as possible, we’ve detailed not only our top recommendations for the best RV AC units, but also a comprehensive guide through the purchasing process all the way through to installation and upkeep. What’s The Difference Between Portable AC Units And RV AC Units? These Dometic air conditioning units are extremely reliable and their customer service is supposedly excellent. Don’t overlook their 2-year protection plus warranty, too. Although the goal is to never need it, having that in your back pocket could help relieve some stress down the line. The only drawback to this unit is its height profile. As we’ll explain further down in this guide, a higher profile on a rooftop unit means more drag in the wind, lowered energy efficiency of your RV, and higher gas costs at the pump. 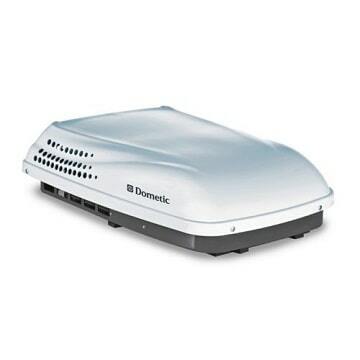 Our all-around favorite, this Dometic RV AC unit is a solid, reliable choice. Its variable listing allows you to customize your order for your unique needs. It also boasts its new “15% increased airflow and improved cooling capacity” technology at a very reasonable price, making this our clear winner. If you’re on the fence, take a look at the reviews. The great thing about selling sites like Amazon is the ability to read first-hand accounts from buyers just like you and their experiences with that specific product. This product, in particular, is loaded with helpful reviews, customer pictures, and over 200 answered questions. This AC unit comes both in white and black color, allowing you to match your RV’s paint job or optimize its heat absorption. You also have the option to upgrade from 13,500 to 15,000 BTUs for just an extra $80, a power difference that will make a huge difference for some RV setups. The Coleman RV AC unit boasts extremely positive reviews that detail use with the unit several years down the road. There are even several users that mention the products absolute pristine condition upon delivery despite seemingly horrible transit conditions and packaging. This machine is extremely heavy. Now, all AC units you’re going to be looking at are pretty hefty devices, but this one takes the cake. For those looking to perform their own installation, this might prove an additional obstacle. It’s also a very high profile, at 16 inches it stands even higher than the Dometic AC unit, something to consider if you’re looking to maximize your mileage. This Coleman AC unit is another workhorse for cool air. A very close runner-up and still an excellent choice, this machine is tried, tested, and proven. This unit also comes with the standard Dometic AC warranty of 2 years, a big plus if you’re planning to use this pretty often. It is also customizable with variable options. You can choose the black or white version, and you can also select between the 13,500 and high-capacity models. You might think that a slimmer machine means a lighter one, too. But you’d be wrong. This unit is a heavy beast, so make sure you’re prepared to lug it up to your rooftop. This is also a rather high amperage unit. If you’re circuits are wired high enough, this isn’t an issue, but if you’re on a limited system this is something important to consider. This low-profile unit is not only more sleek and stylish than some of the higher-profile units, but will also help save you some gas money down the road. For this reason, consider the added purchase cost more of an investment, one that distance drivers will likely get back extremely quickly. For such a powerful device, a little bit of energy efficiency can go a long way. This unit comes with a desirable 2-year warranty as well as Coleman’s excellent customer service. As mentioned, this unit is also very energy efficient, requiring only 8.9 amps to run, so it’s perfect for smaller rigs or even van-dwellers looking for some cool air. This unit is not extremely powerful. At only 9,200 BTUs, this will likely not be very effective at cooling larger rigs. This may just mean you’ll need a second unit, but it also might mean you should look elsewhere for a unit equipped with the power to efficiently cool your entire vehicle. This Coleman AC unit is a great option for low-power systems, as it operates on just 115 volts and 8.9 amps. This machine is extremely powerful at 15,000 BTU but still runs on a limited energy circuit at just 120 volts and 1500 watts. The biggest advantage to this device is it’s built-in heater. As we’ll discuss further down in this article, some newer units take advantage of modern technology and are actually able to reverse the cooling feature to output heat as effectively as it does cool air. If you’re an all-season traveller or tend to visit cooler climates as often as hot ones, this unit might be a great investment. This machine costs as much as two standard RV AC units, but the fact that it’s multifunctional might mean that this one air conditioner takes place of two separate devices you might need to purchase. This is a big buy, one that you should really consider fully if it’s worth it for your needs. If you’re expecting to frequent climates towards both ends of the extreme temperatures, this might be worth your while. As mentioned, this unit also has a very sleek, slim profile, helping you maximize your RV’s fuel efficiency even on long hauls. It’s never been easier or more affordable to bring the luxury of fresh, cool air along on all your adventures. In fact, nearly every modern RV comes with at least one AC unit standard. That may lead you to think you’d never be in the market for a standalone AC unit, but the truth is these machines have a limited lifespan, and you’ll likely need to replace your air conditioning unit several times before your RV’s lifespan is even near complete. So whether you’re purchasing a replacement unit or you’re looking to install air conditioning altogether, starting the search seems like a monumental task. With the now-saturated market offering an overwhelming range of products and features, how can you know which RV AC unit is best for you? All the product specs in the world will only continue to overwhelm you until you know what you’re looking for. At the end of the day, there is no one right answer for everybody, and the right unit for you depends on factors like the size/build of your RV, your electrical system, and most importantly, your specific needs from the unit. But before you can even start to consider a unit, you should understand the basics of them, first. You might wonder what all the fuss is about rooftop AC units for RVs. There are definitely alternate options, such as a more traditional portable AC unit. These can be very powerful and effective, but tend not to be ideal for RV spaces as they take up a fair amount of floor space, a vital commodity in a tight space like an RV. There are also window AC units being produced that are actually small enough to operate in an RV setting, but due to them being new to the market, it’s a rather risky unit to invest in. 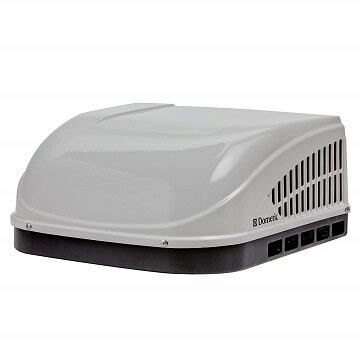 Ultimately, a rooftop AC unit is best for most RV users. But choosing that is far from the only decision you’ll have to make. There are a wide range of factors that you should thoroughly consider before making your purchase. If you’re replacing an existing AC unit, it is essential that you purchase an RV that will fit into the same size mounting hole that you have on the top of your RV. This should be your absolute first consideration as you start looking for a new AC unit. The height of your RV’s AC unit will also affect a couple of things. Since these units attach to your RV’s rooftop, a taller profile on your AC unit means a taller profile for your RV. For some people, this consideration is a non-factor, but if your RV already makes for a tight squeeze in your garage spot or under bridges in-transit, you might want to seek out a slimmer device. Even if those factors don’t seem that important, I hate to break it to you, but size still matters. A large unit attached to your roof makes for poor aerodynamics, the effects of which will show up on your gas bill. AC units with a more sleek design tend to be a bit pricier, but every mile you drive with it, you’ll be making that money back at the gas pump. The downside to smaller, slimmer units is that they tend to also be less powerful. Which brings us into the second consideration when selecting and AC unit for your RV: power. As you look at various AC units, one of the first things to look at is their BTUs, or British Thermal Units. This is the measurement for power. The standard power for RV AC Units is 13,500 BTU, however plenty of people end up preferring more or less BTUs depending on their specific needs. SO HOW MANY BTUS DO YOU NEED? If you frequent extremely hot locations or climates that might be particularly testing on an AC unit, you should look for a device with higher BTUs, like the Coleman AC unit we recommended above, which boasts a rating of 15,000 BTUs. 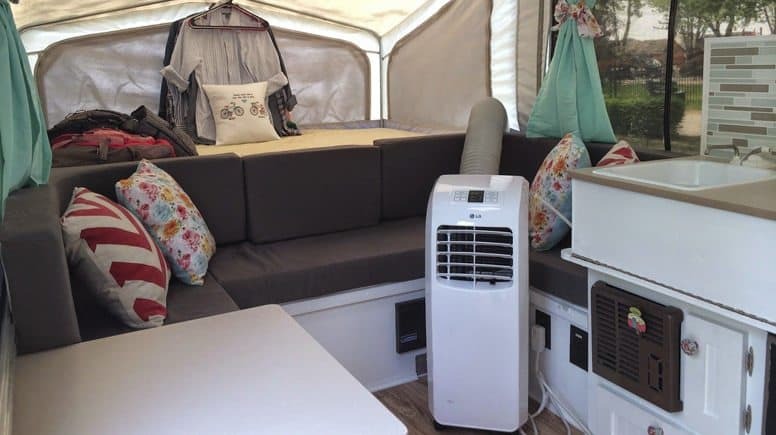 On the other hand, some travellers prefer a less-powerful device like this other Coleman RV AC unit if they don’t travel to very hot climates or if their vehicle is small enough that it doesn’t require as much power to cool. You should also consider just how much time you intend to spend in your RV. If you’re a more casual user, you’ll likely need a less powerful unit than someone who lives full-time in their RV. DO YOU NEED A SECOND AC UNIT FOR YOUR RV? If you’re concerned that even the most powerful AC unit won’t be enough to keep your entire rig cool, you might be right. The general rule of thumb is that RVs can cool sufficiently with one AC unit if they’re under 32 feet. Above that, you might want to consider purchasing a second unit. This is mainly due to the airflow issue with such a large vehicle, and one little unit can struggle to circulate cool air throughout the cabin. A lesser-considered factor in considering a second unit is surprisingly, the color of your RV. Darkly-colored vehicles, particularly black ones, absorb much more light and therefore heat from the sun, turning the inside of your RV into a sun-baked oven. If your RV is over 32 feet or painted with a dark, heat-absorbing color, you might want to look into a second AC unit. Further than just the various specifications of different AC units, there are actually different types to consider, as well. This factor is really determined by your RV, so make sure to get a unit that works with your vehicle. A non-ducted unit simply blows the cool air out of the bottom of the unit itself, whereas a ducted AC unit connects to the duct system in your RV, distributing air throughout several ducts. A ducted system is highly preferable, and can often seem much more powerful than non-ducted systems which are often much slower to circulate cool air to every corner of your rig. They also tend to be much more energy efficient, as they are much more effective at dispensing cool air and end up using less power. If you already have a portable AC unit, it will definitely work to cool down your RV, but as we’ve mentioned before, it may not be ideal to use in such a small space. If giving up some extra space isn’t an issue for you – an all but nonexistent phenomenon amongst our RV crew – then this really isn’t a bad option. For the rest of us, a rooftop unit is the way to go. You don’t have to give up a single square inch of square footage and you still get all the benefits of luxurious, cool air. Speaking of luxuries, a heat pump can be a huge plus for all-season campers. Some RV AC units, like the Dometic AC unit we featured previously, have built-in heat pumps. Through incredible technology, they’re able to reverse the cooling features to powerfully but efficiently heat your RV as well as cool it. This feature is especially beneficial to campers who frequent chillier climates or full-time RV dwellers who travel throughout every season. The somewhat-obvious downside to a heat pump is the cost, units with reversible systems are often quite pricey, and ones that don’t include a heat pump will require you to purchase one separately. In a mobile home, power consumption is a pretty big deal. If you’re off-the-grid, you have to be aware of your limitations and ensure you’re not exceeding your generator’s capacity. Low power consumption AC units can be really handy in these cases, as they’re designed to provide the same cooling power but on a lower amperage. Even for RV users who don’t spend much time off-grid, an energy-efficient unit will still be beneficial. Almost all electrical hook-ups have their limitations, and most campsites will limit your usage, causing you to trip a circuit if you exceed the amount of power allotted to you. A low power consumption model can help you avoid these issues, so make sure to fully consider your power needs before you purchase a unit. Hopefully you’re starting to feel good about the type of AC unit you’d like to buy for your RV, but your purchasing decisions don’t end there. You might want to consider some accessories as well. A cover for your RV’s AC unit might be a worthy investment, as they help protect your unit from the elements and therefore extend its life. An important thing to note is that covers are not meant to be used during transit, but rather once your RV is stationary, making this a great option for people who tend to stay in one location for an extended period of time. These covers can prevent draft when the temperatures drop by sealing off the vents of your AC unit, this seal also ensures that no leaves or other debris enter the open fans of your unit. If you’re looking to increase the longevity of your AC unit, or if you will be using it in particularly inclimate weathers, a cover is a great investment. A thermostat is another accessory you might want to consider purchasing for use with your AC unit. These devices hook up directly to your AC, monitoring both the internal ambient temperature of your vehicle, as well as powering your AC unit to match whatever temperature you’ve preset. Thermostats can help you make the most efficient use of your RV’s AC unit, by only applying power when the temperature rises above your ideal temp. It also takes nearly all the effort out of this from the user’s standpoint, as you simply set it and forget it. No need to constantly be turning your AC on and off to try to reach your ideal temperature. Most modern thermostats also let you preset a schedule. This is extremely helpful if you prefer a cooler temperature at night than during the daytime, or perhaps if you’re away from the RV for the same time slot consistently. For instance, if you work the standard 9-5 job, you can preset your AC to turn off while you’re away so you’re not wasting energy cooling an empty cabin. In this scenario, you can also preset it to turn back on just before you’re due to arrive home, allowing you to walk in to a nice cool environment the moment you get back to your RV. Overall, a thermostat is a pretty small investment when compared to the price of the actual AC unit, and for most people, the increased energy costs and ease of use more than make up for the additional cost. For the most part, an RV AC unit is pretty self-sufficient once it’s installed. After awhile though, you may notice it not cooling the same way as it used to, or perhaps emitting a different or strange noise while in-use. This likely means it’s time to replace your air filters. Fortunately, this isn’t a very expensive process, and you’ll likely be able to do it yourself. Make sure to purchase replacement filters for your exact model or there’s a chance it won’t fit. For this reason, we recommend purchasing a few filter replacements at the time you purchase your AC unit, so that when the inevitable happens, there’s not any chance that the replacements are out of stock or out of production altogether. 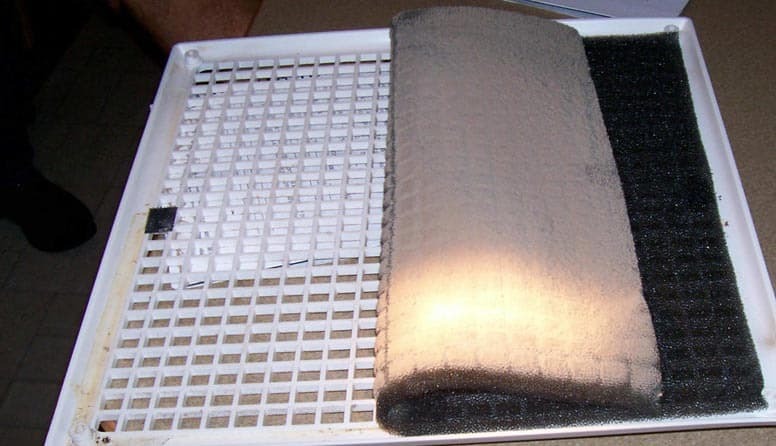 Another option is to thoroughly wash and rinse out your existing air filter. Some air filters are more or less capable of withstanding a thorough scrubbing, so this one is best left up to a judgment call. Now that you’ve learned everything you need to make an informed purchase of your RV’s AC unit, it’s time to take the next step. This might sound like an intimidating endeavor, but if you’ve got a basic set of tools, some can do attitude, and maybe a friend or assistant to help you haul the thing up to your roof, it might just be easier than you’d think. Stop. Read the installation instructions for your specific unit. The follow directions are general tips, but any specific installation guides should supersede any generalized guide you may find. Make sure you’ve accounted for any pieces that came with your unit as well. Make sure to turn off the RV’s electrical power. Remove the AC unit’s shroud from the top of the RV. This step isn’t necessary, but will help make some of the following steps easier. From inside the RV, take off the control panel cover. This typically simply slides or pops off, but if you have a more complicated unit, you might need some screwdrivers to remove the control panel. Remove the faceplate from your old AC unit. This should be a separate thing from the control panel, and will likely involve the use of a screwdriver to remove. Locate the bolts that connect your AC unit to the roof of your RV. You’ll remove these completely once your on the roof, but for now, loosen them almost all the way with a crescent wrench. This will make your job much easier once you’re up on the roof. When you removed the faceplate, you should have uncovered some electrical wiring. There should be a live, neutral, and ground wire connected likely via wire nuts. Simply twist these off to remove and disconnect your electrical connections. Now it’s time to get on top of your RV. If your RV doesn’t have an access ladder built-in, you can use any tall enough ladder, just use precaution. Use a putty knife to strip away any caulking around the seam between the AC unit’s gasket and your rooftop. Depending on the adhesives or flashing used to secure your old unit to the roof, there may be a fair amount of debris built up. There also tends to be build up from roof treatments over the years securing your RV from leakage, so depending on the state of your seams, this task might take a bit of elbow grease. Remove the nuts that are holding your AC unit onto the rooftop. Most of the time, there will be 4 main nuts, threaded through the 4 bolts you already loosened in step 6. Locate these once again and remove them fully. 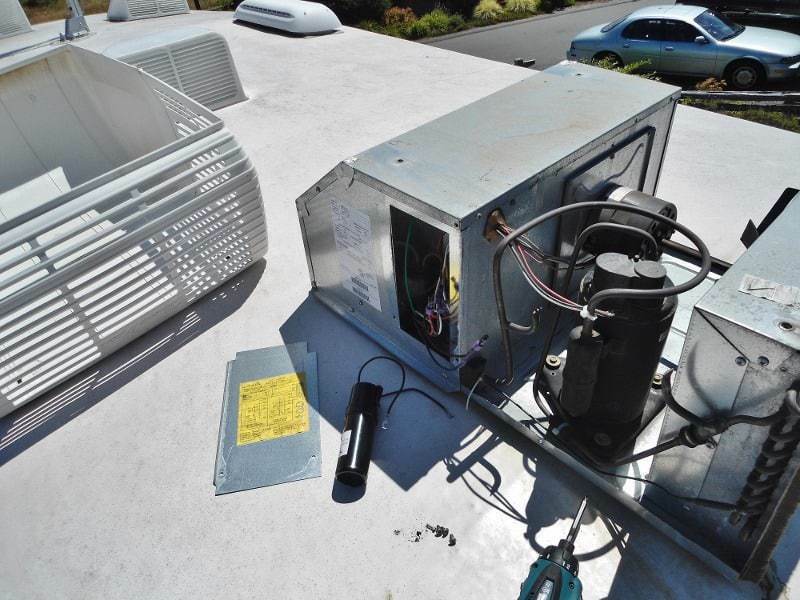 There should no longer be anything attaching your AC unit to the roof of your RV. Remember that friend or assistant I mentioned you might be needing? Now’s his chance to shine. Have them get in the RV and push from below while you lift the AC unit out of the rooftop. Make sure you have a solid grip on the unit before you do so, as these are typically much heavier than you’d expect, and the last thing you want is a 90 lb AC unit tumbling down the side of your RV, wrecking havoc along the way. Definitely not talking from personal experience. Have your friend come outside and carefully pass the AC unit down to them, again ensuring you both have firm grips on the unit before you transfer off the weight. Do not attempt to carry the unit down the ladder by yourself. These things are extremely heavy and very awkward to hold, one slip could lead to more pain than it’s worth. Once again, stop and read your unit’s instruction manual. Nothing in this guide should supersede the installation instructions that came with your specific unit, this is just a general reference. Start with a clean surface. A clean, tight connection between your AC unit and the roof of your RV is absolutely essential for preventing leaks and drafts. The longer your old unit was in place, the longer this step will likely take you, but it will improve not only the efficiency of your unit, but also its longevity. Once again, you’ll need a friend or assistant to help you safely get the new AC unit on to the top of your RV. DO NOT attempt to climb up yourself holding an AC unit, not only will you likely damage yourself and your RV, but also your brand new air conditioning unit. Instead, climb up first and take the unit from someone standing on the ground. Again, take your time and make sure you have a firm hold before they pass it off. Nobody wants an AC unit dropped on their head. Align the new AC unit with the mounting hole on the roof of your RV and carefully place it into the hole. You’ll want to fully seal the seam with a caulk gun. Take care to seal off any and all gaps between the AC unit and the surface of your RV, failing to do so will also lead to leaks and drafts, decreasing the effectiveness of your unit and potentially causing damage to your vehicle. Then, thread the bolts back into the unit to secure it to your roof, you can tighten these from below, so just give yourself a good start. All done on the roof! Climb down and head inside to finish installation. Now you’ll want to connect the electrical wiring. This should be easy as they are almost always color coded. The white wire indicates the neutral wire, and red or black typically designates the live wire. Your ground wire is probably bare. Match up the new AC unit’s wiring to your RV’s and twist the ends of the connections together. Screw a wire nut on the connection and you’re all set. Screw on your new faceplate and reattach the cover. This will likely snap or slide into place. Now it’s time to test it out. Turn back on your RV’s electrical and give the AC unit a try. Hopefully, you get rewarded with a blast of cool air. If not, take a deep breath, a step back, and work your way back through this guide from step one, referencing your installation manual often. Hopefully this handy guide has given you the confidence to select, purchase, and ultimately even install your RV’s new AC unit. If you educate yourself and arm yourself with enough knowledge to get you through, this task shouldn’t intimidate even a novice handyman. If you still think this is a bit too intimidating to tackle on your own, contact a local electrician or other professional to help, they might be providing more peace of mind than anything else, but at the end of the day that might be worth everything.